Is the clock still ticking? Has the 60 Minutes TV show been cancelled or renewed for a 51st season on CBS? The television vulture is watching all the latest TV cancellation and renewal news, so this page is the place to track the status of 60 Minutes, season 51. Bookmark it, or subscribe for the latest updates. Remember, the television vulture is watching your shows. Are you? 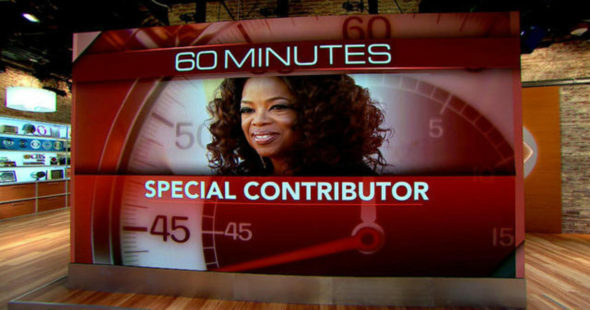 Airing on the CBS television network, the long-running 60 Minutes is the gold standard for TV news magazine series. The stable of hosts and correspondents includes Steve Kroft, Lesley Stahl, Scott Pelley, Lara Logan, Bill Whitaker, Anderson Cooper, Charlie Rose, Norah O’Donnell, Sharyn Alfonsi, and Oprah Winfrey. The show features investigative reports, interviews, human interest segments, and news-maker profiles. The 50th season of 60 Minutes is averaging a 1.34 rating in the 18-49 demographic and 10.51 million viewers. Compared to season 49, that’s down by 14% in the demo and down by 6% in viewership. Find out how 60 Minutes stacks up against the other CBS TV shows. 60 Minutes has been renewed for a 51st seasonwhich will debut on September 30, 2018. Stay tuned for further updates. Wondering if 60 Minutes will be cancelled or renewed for season 51 seems a bit silly. This venerable CBS TV series remains a Sunday night staple. Still, networks use the ratings beyond cancellation and renewal decisions. They also depend on them to help determine when a show could use some retooling. I’ll keep an eye on the Nielsen ratings and update this page with breaking developments. Subscribe for free updates on any 60 Minutes cancellation and renewal news. 4/18/18 update: CBS has ordered season 51 of 60 Minutes for the 2018-19 season. Details here. Find more 60 Minutes TV series news or other CBS TV show news. What do you think? Are you glad that the 60 Minutes TV show has been renewed for a 51st season? How would you feel if CBS had cancelled this TV show, instead? More about: 60 Minutes, 60 Minutes: canceled or renewed?, 60 Minutes: ratings, CBS TV shows: canceled or renewed? FBI: Has the CBS TV Show Been Cancelled or Renewed for Season Two? Bull: Is the CBS TV Show Cancelled or Renewed for Season Four? Happy Together: Is the CBS TV Series Cancelled or Renewed for Season Two? Mom: Cancelled or Renewed for Season Seven on CBS? Pink Collar Crimes: Is the CBS TV Series Cancelled or Renewed for Season Two? Whistleblower: Is the CBS TV Show Cancelled or Renewed for Season Two? Bull: Cancelled or Renewed for Season Three on CBS? Candy Crush: Is the CBS Game Show Cancelled or Renewed for Season Two?